1. Preheat the oven to 180ºC, gas mark 4. Place the hazelnuts on a baking tray and toast for 5-10 minutes or until golden. Remove from the oven and leave to cool completely. 2. Place the hazelnuts with the remaining ingredients in a large bowl and mix together, adding a splash of water if the dough feels dry. Tip onto a well floured surface and knead gently to make a soft dough. Divide into three pieces and roll each third into a sausage shape measuring about 20cm x 5cm. 3. Lay the dough sausages on a baking sheet lined with baking paper, making sure they’re well spaced apart. Bake in the oven for 25 minutes or until golden brown and firm to the touch. 4. Leave to cool slightly and then, using a bread knife, cut each roll on the diagonal into about 20 slices each about 1cm thick. 5. Place onto 2 baking sheets lined with baking paper. Turn down the oven to 140ºC, gas mark 1, and bake for 10-15 minutes or until firm and crisp. 6. Transfer to a wire rack to cool completely. 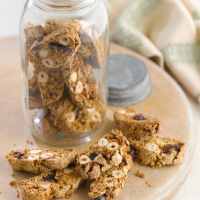 These biscotti will keep for up to a month in an airtight container.